Sleep time, the depth of sleep, and the various stages and cycles that make up sleep are best measured by means of polysomnography, which simultaneously measures several body functions such as brain activity (electroencephalogram or EEG), eye movement (electrooculogram or EOG), and skeletal muscle activity (electromyogram or EMG), as well as respiration, heart rhythm and a few other pertinent measures. 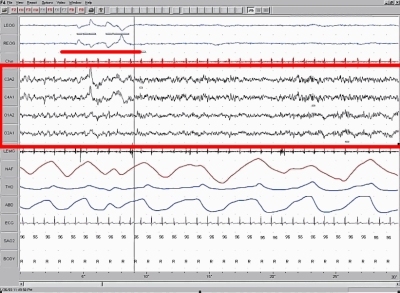 The output from a polysomnograph is called a polysomnogram, an example of which is shown at right. Polysomnograms are usually created as part of a personalized sleep study, often in a specialty sleep clinic or hospital. As part of such a study, it is also now common to videotape nighttime sleep activity in real time, to match against polysomnogram traces. Certain frequencies displayed by these measurements, and sometimes the relationships between them, are characteristic of the different stages of sleep or wakefulness the subject is in. A hypnogram (see the example below) is a simplified graphical representation of the results obtained from a polysomnogram over a complete sleep period, presented in the form of a histogram or bar chart, and is a useful way of showing sleep cycles and the timing of the different sleep stages in an intuitive and easily visible way. The structure or pattern of sleep which emerges is often referred to as a person’s “sleep architecture”. Irregular sleeping patterns associated with various sleep disorders can often be detected in this way, as can the effects of certain medications or treatments. A less invasive, but less accurate and reliable, method of sleep measurement involves a wrist-mounted unit called an actigraph, which essentially measures gross motor activity and movement, and which gives a rough and ready guide to sleep and wakefulness patterns. The output of an actigraph is called an actigram, and presents a simple graphical representation of a person’s sleep-wake cycle over several days, weeks or even months. This can be useful as a quick visual guide to the timing of sleep over an extended period. Self-reported sleep patterns are quick, cheap and easy, but are usually considered unreliable, at least compared to these science-based measurements. This is especially so given the prevalence of “sleep state misperception” in which people typically under-estimate the length of time they sleep (and particularly over-estimate the time they take to fall asleep). It is not uncommon for someone to estimate, say, four hours of sleep when in fact they have slept for closer to seven or eight hours. Ingrained or chronic sleep state misperception may even be considered a type of sleep disorder. Specially designed questionnaires like the Epworth sleepiness scale can help to guide responses to some extent and make self-reported results more reliable, although they remain necessarily subjective. Daytime sleepiness can be measured in two main ways: the multiple sleep latency test (MSLT), which measures the time needed to go from complete wakefulness to sleep onset in a series of daytime nap opportunities; and the maintenance of wakefulness test (MWT), which measures an individual’s ability to stay awake while reclining in a quiet darkened room.